Recently had the chance to try out one of the most affordable and quite popular full-color 3D scanners, the 3D Systems Sense 3D scanner. We have purchased the Sense 3D scanner to check it out because of its very attractive price compared to almost all alternatives and the fact that the device is handheld and offers the ability to scan larger objects. While the results we got in terms of the 3D mesh detail were pretty good, the texture information was pretty low resolution and not very usable, so we started looking for a better alternative that is not much more expensive. Our search have lead us to discover another handheld full-color 3D scanner – the Fuel3D, a project that has apparently been started on Kickstarter back in 2013 and now they are apparently shipping the device to backers. Fuel3D is also taking orders from new customers with a price of the device set at $1490 USD and with a shipping date set for March 2015. The technology used in the Fuel3D scanner system is different than what most other 3D scanners use, the Fuel3D relies on two cameras and three flashes to capture the depth and detail information. Judging from the sample scans from the Fuel3D 3D scanner it does manage to provide maybe slightly better detail level on the 3D mesh scan and a significantly better texture information than what we’ve managed to get with our 3D Systems Sense 3D scanner. Do note that the Sense 3D scanner is available for just $399 USD, so it is significantly more affordable as compared to the Fuel3D, even though the level of quality you get is not as good as with the more expensive unit. On the other hand the Fuel3D probably does provide a lower quality when compared to a professional 3D scanner that may cost thousands of dollars. So it all goes down to what you need to do with the 3D scanner and if you only need the 3D surface information or also the texture on top of it, if you can do only with the first and you don’t need too detailed scans then the Sense 3D scanner probably should do. If you also need a more detailed texture information for use along with the 3D geometry of the scanned object than the Fuel3D is probably going to be the better choice. Looking over the specifications of the Fuel3D scanner we should also note that it is apparently not designed to scan larger objects, so you are limited to more like the ability to scan a human head and not a the whole body – something that you should be able to do with the Sense 3D scanner for example. Even though both devices are handheld, it seems that the technology used in the Fuel3D scanner is able to produce better results, but is more limited in the size of the things you can scan and also it might take more time to scan a more complex object. 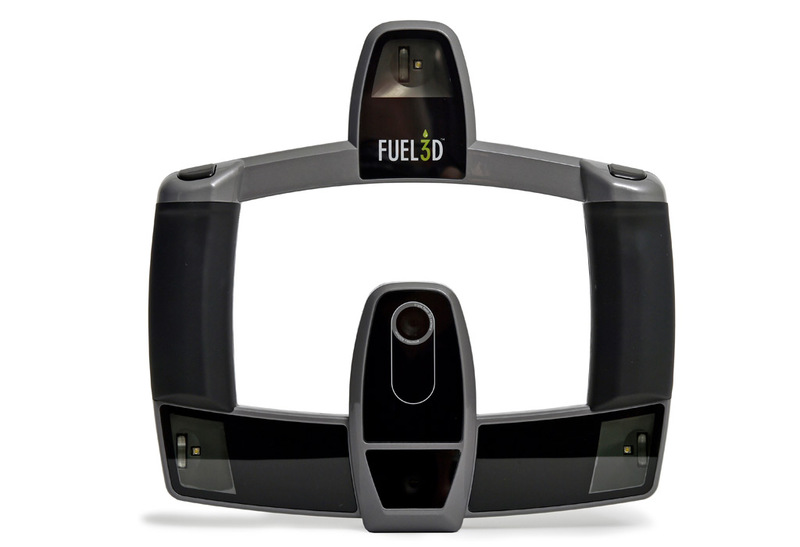 Still the Fuel3D 3D scanner does seem to be an interesting and affordable 3D scanner system in the form of a full-color device that is handheld and is priced so that it can be interesting for the non-professional users.